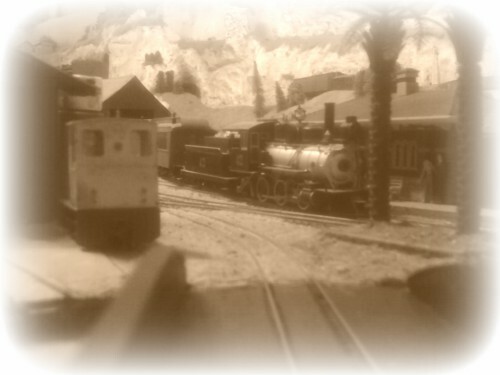 The headcode I always associated with the Brighton line was 4 - the Brighton Belle. I believe this comes from the scheduled travel time for the train Fifty-Nine minutes. If anyone knows differently please let us know. So I suppose you could argue that the 4 code was a result of the speeded up film version of the run. Only if the Belle didn't carry it before the film was made. I once heard a story about the Belle motor driving car at the Little Mill Inn in Rowarth. A haulage contractor was talking about jobs involving cranes. He said that he had delivered the car to the pub, but there was no way he'd tender for the job of removing it because there was a new building on the site where the crane was positioned during the installation and it would require a much bigger crane to get it out again, so big that it wouldn't fit down the lanes leading to the village. The SW terminus of the FCPyF is in a large city called, appropriately, Ciudad Grande. 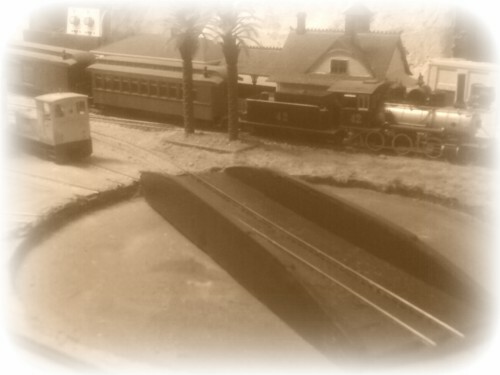 The name was previously used for the smallest module in the Ferrocarril Internacional layout but this module was dismantled some time ago. The new Ciudad Grande, or just Grande in FCPyF documentation, is taking shape as a peninsula parallel to Centrales. After some doodling and eventually laying sections of track on the baseboard to try them for size, a final plan has been drawn. 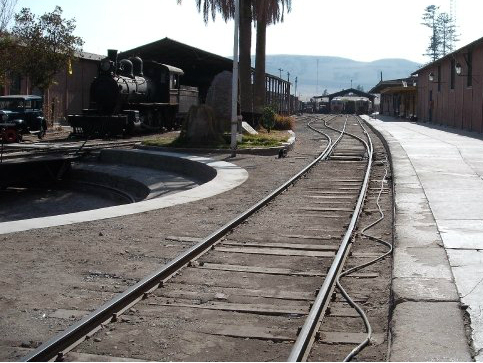 It is a much (very much) simplified version of Tacna in southern Peru and will incorporate the main features of the station, including the clock tower gateway, albeit on narrow gauge instead of standard. 1-Station. 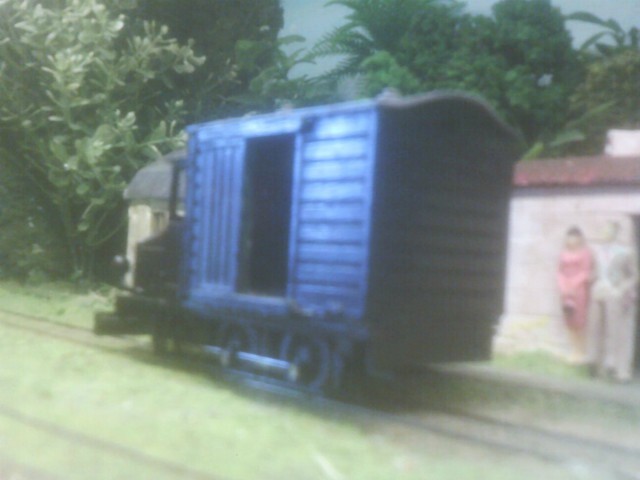 2-Carriage shed. 3-Goods. 4-Loco. 5-TT. 6-Clock tower. 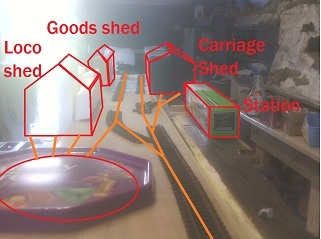 The mock-up above was done to compare with the prototype photo, the eventual track plan is further simplified to save width but retains the key features of the station. 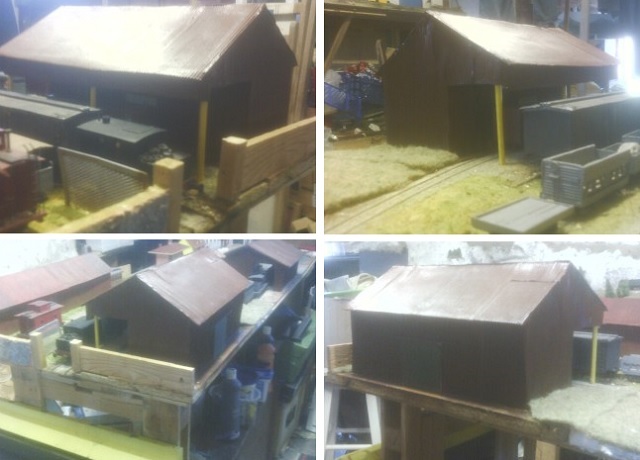 1-Carriage shed and railcar lean-to. 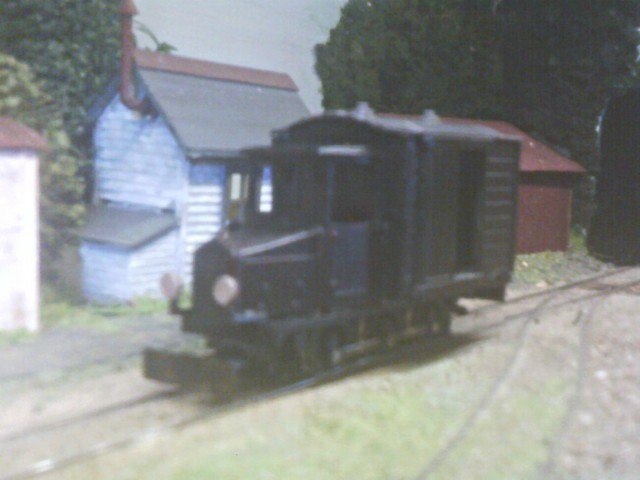 2-Goods shed. 3-Station. 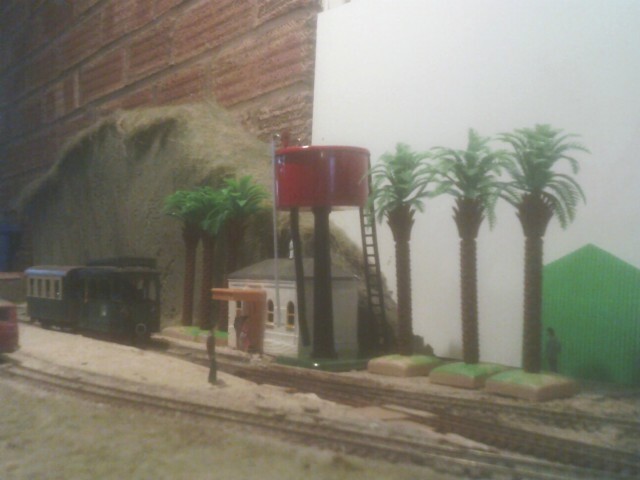 4-Loco shed. 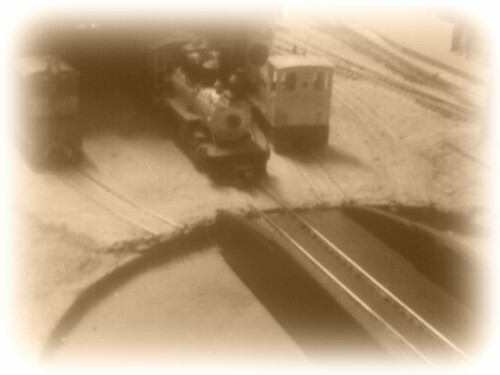 5-Turntable. 6-Gateway (exit to fiddleyard). I had originally intended to connect Grande to Centrales via a 180 degree curve but have decided instead to use cassettes when transferring trains between the two stations. 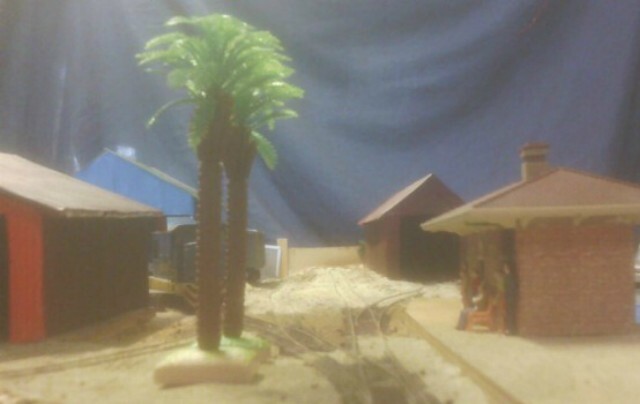 This is for two reasons, primarily to avoid the tight (18") radius curve and secondly so that the Grande section of the layout can be moved if anything bigger than a wheelie bin requires access to the garage. 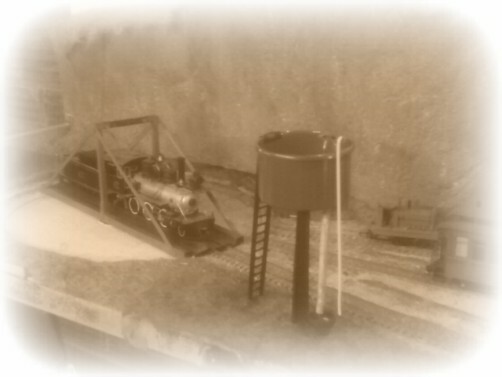 I know 18" is not excessively tight for 16.5mm gauge in O scale but it just doesn't look right with colonial narrow gauge stock on it. 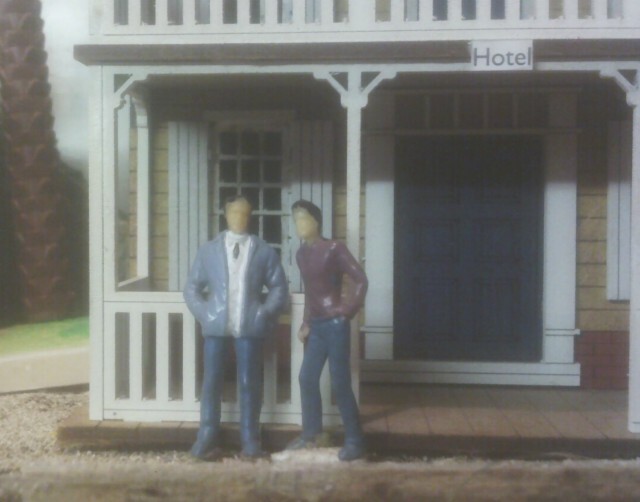 Prototype photos by a former barmaid at the Nags Head who left to go globetrotting. Prototype plan adapted from Bing Maps. 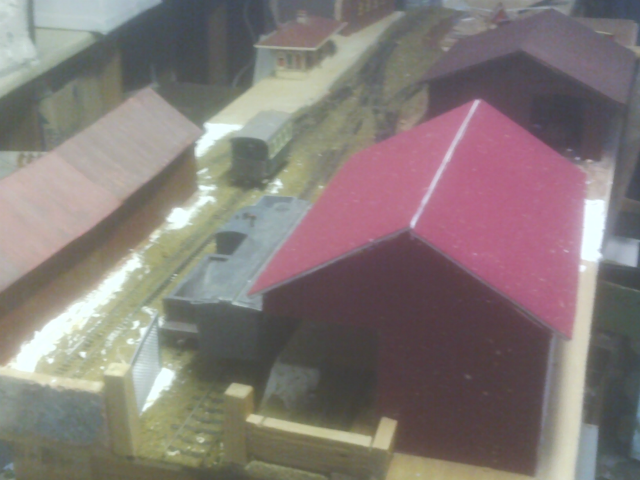 The shell of the goods shed now dominates the yard at Grande. It is being built in situ and has turned out a bit larger than I expected. 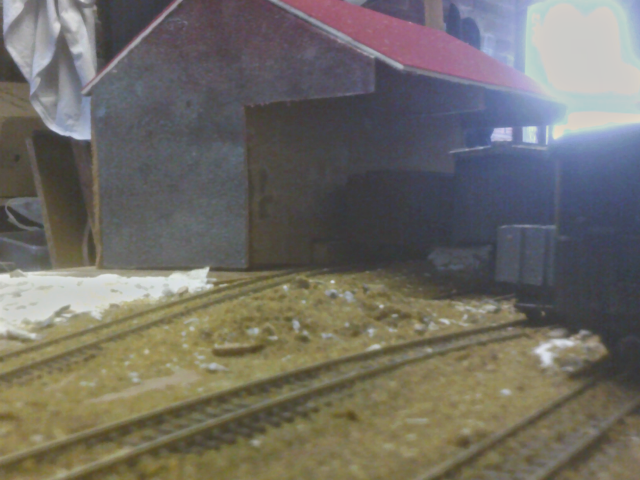 The loco shed made me realise how big O scale buildings can be but the goods shed is even bigger. The view from the end of the station platform shows the subtle differences in track level around the interchange siding. 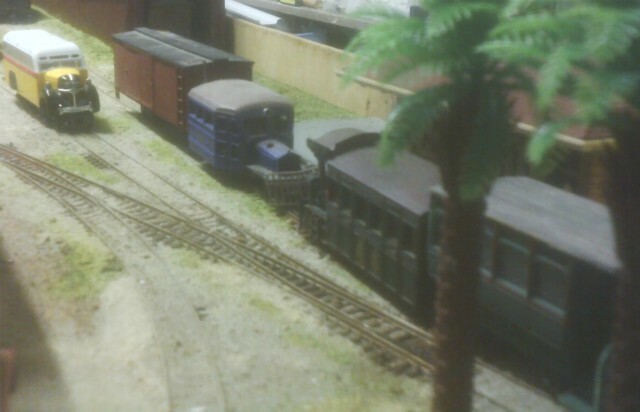 The shed road climbs slightly, allowing a cross platform transfer from the narrow gauge to broad gauge wagons. 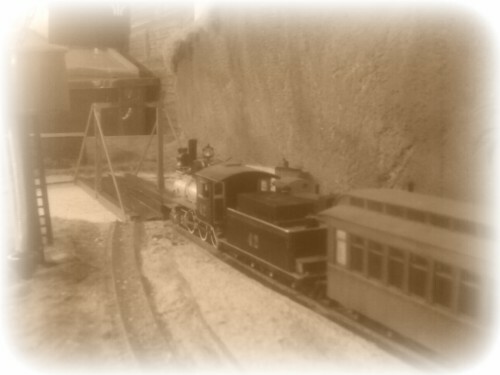 The middle road drops, allowing easier loading of goods from the broad gauge to narrow gauge wagons. 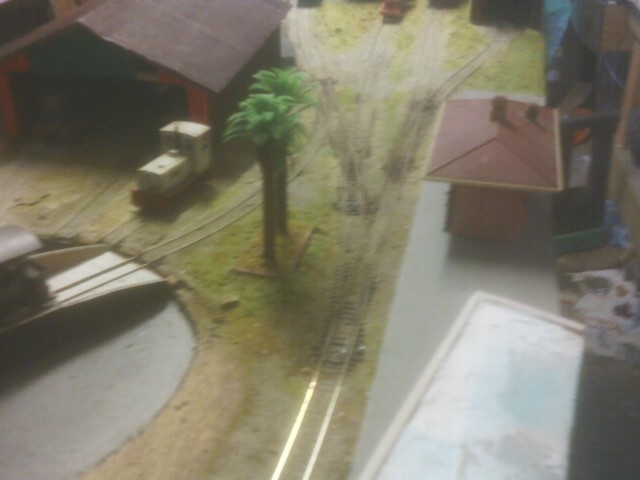 The main line in the foreground is level. The thick plottens... Or something like that. 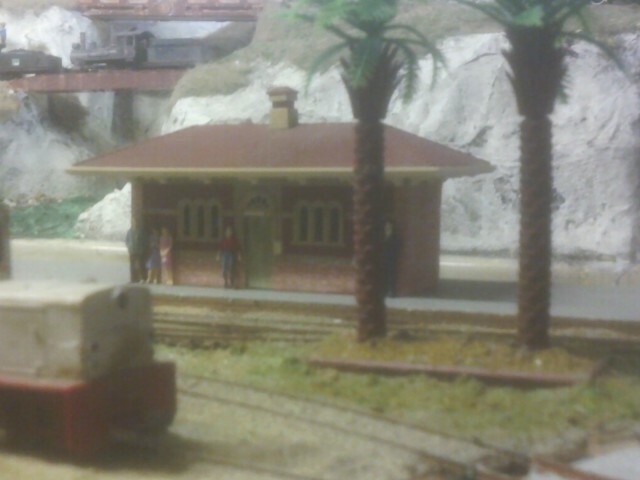 An essential feature in the photos of Tacna is the pair of palm trees between the loco sidings and the station. 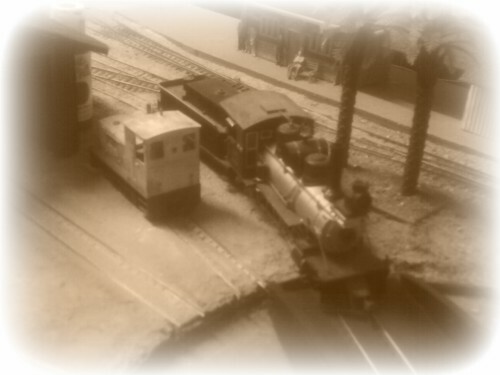 So they just have to be included in my model of Ciudad Grande. Very lush! Did you have to thicken the trunks up? I've planted them in a raised "flower bed" like the one at Tacna, but otherwise as supplied, no beefing up required... They're G scale. I reckon Rio looks better with the tower removed. It used to cast a shadow on the backscene, which tended to spoil photography from certain angles. On the rails, there's a new freight motor, built on the frames of a scrapped steam loco. Giving Tri-ang collectors a rest but Gnomy fans may wince at the sight of more plastic carnage. 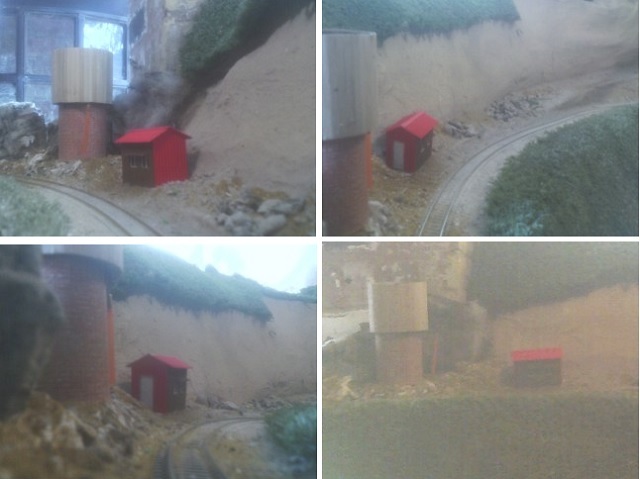 Edit - Giles has asked about the goods shed at Grande. This building is more or less completed, just needing a coat of matt varnish to take the shine off the paint. Less so for normal people though! Working the afternoon mail, July 8th, '17. 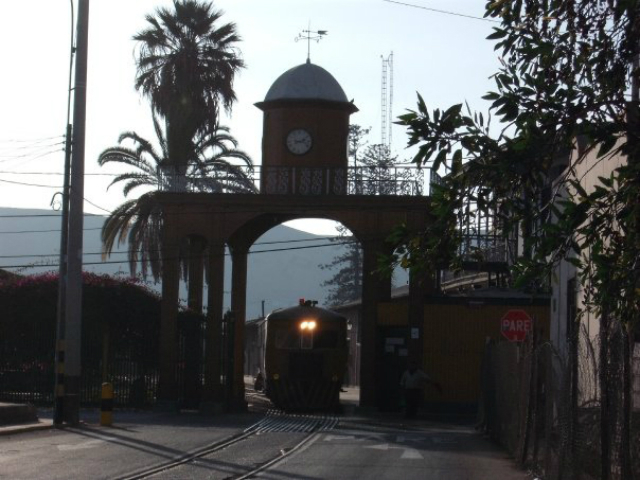 On arrival at Cuarto #42 stands while the train is unloaded..
... then turns, ready for the return trip. Just caught up with your latest blog, Bob. Looks like you've had a very well-spent Saturday. 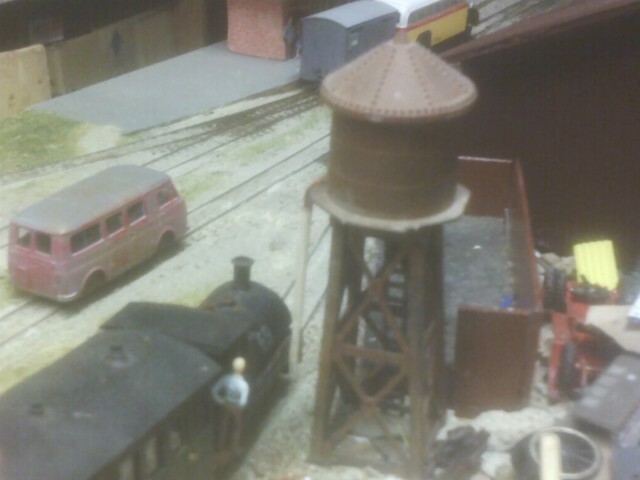 I particularly like the fuel oil tanks, with what looks like one of Ian's gizmos for the fuel pipe connection for the steam loco filler. Great stuff.